Finding aids for these collections are not available online at this time. Please contact Jennifer Nieves (jennifer.nieves@case.edu) for further information. This PDF includes information on hospitals, medical schools, dispensaries, asylums, clinics and other institutions with a medical purpose. It is available upon request. These collections are large enough to be housed in record storage boxes, click major collections for more information on each of these topics. These collections vary in size. Some are contained in a single file folder, others in one or more acid free boxes. The collection includes newspaper clippings, public relations brochures, short histories of local hospitals collected by Kent Brown, MD, editor of Medicine in Cleveland and Cuyahoga County, 1810-1976. Huron Road Hospital includes two published histories of Huron Road. Information can also be found under Homeopathy-Cleveland. Nottingham Hospital See Cannon, James Carl, box 2. Rainbow Babies and Children’s Hospital Newspaper articles, pamphlets on nutrition for children distributed by the Babies Dispensary, historical articles. St. Vincent Charity Hospital Newspaper clippings, Constitution and Bylaws, 1937, Centennial Report, 1865-1965, Biennial report, 1898-1900 Other materials are housed in the Bunts Family papers. University Hospitals of Cleveland In 1925, Babies and Childrens Hospital, the Maternity Hospital and Lakeside Hospital joined to form University Hospitals. Babies and Childrens and Maternity opened new buildings in University Circle that year, and were joined by Lakeside in 1931. Cleveland State Hospital (Newburgh Asylum) The Northern Ohio Lunatic Asylum was opened in 1855 and operated as a facility for the long-term care of those considered insane. The state began to close the hospital in 1972 and the building was demolished in 1977. The collection includes newspaper and journal articles about the history of the Asylum. Please contact the Ohio Historical Society with questions regarding patient records. Windsor Hospital Dr. Christian Sihler established the Windsor Hydriatic Institute Co. in 1898 on Windsor Avenue in Cleveland. Dr. Sihler promoted the method of immersing typhoid patients in baths, which was later adapted to the treatment of mental illness. Hydrotherapy played a major role in the services offered at Windsor Hospital. The Hospital moved to Chagrin Falls, Ohio in 1927 and closed shortly after the stock market crash of 1929. It reopened in 1932 as a psychiatric hospital for private patients. Information about the hospital can be found in the Personal Files under Pillersdorf, Louis. Woodruff Hospital Established as Ingleside Hospital in 1935 by Mabel Woodruff, a psychiatric social worker at City Hospital. Her dream was to found a hospital to bring kindness and good psychiatric care to people of limited means. Ingleside operated until 1969 when it was closed due to conflict between administration and labor and later reopened under new the name Woodruff Memorial Institute. A pamphlet telling the history of the hospital can be found in the Personal Files under Ferreri, Raymond. 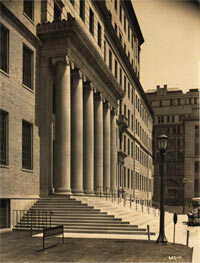 For related articles visit The Encyclopedia of Cleveland History-Hospitals and Health Planning. To see postcards of Cleveland Hospitals visit the Cleveland Memory Project’s Postcards of Cleveland. The Center does not hold patient records in its collections.